As the 2016 presidential field starts to take shape, many on the Republican side are pitching themselves squarely to the most conservative wing of the GOP. Sen. Ted Cruz of Texas, in particular, has argued that the key to Republican victory next year will be nominating someone – presumably himself – who can inspire “millions of courageous conservatives” to vote. Given the limitations of exit polls, it’s hard to assess whether such a factor was at work in the cases of McCain or Romney, though at least some in the Republican Party are skeptical. What we do know is that, by several measures, people who self-identify as conservative Republicans (and GOP-leaning independents) already are more politically active than most other segments of the population. Take voting, for starters. We did a new analysis of merged data from Pew Research Center surveys conducted during the fall 2012 campaign; the data combine party identification among the general public (including those who lean toward one party or the other) with their ideological self-identification. 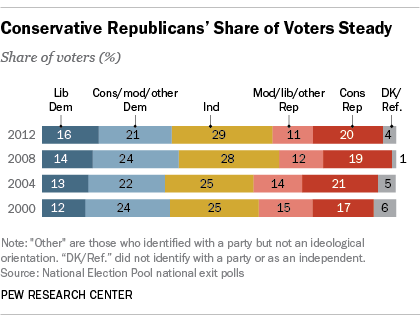 The analysis shows that in 2012, 82% of conservative Republicans and Republican leaners were “highly likely” to vote, by far the highest rate of any subgroup. Conservative Republicans and leaners also rated highly on other indicators of political engagement. They were the likeliest to say they closely followed government and public affairs “most” or “some” of the time: 80% in 2012, ahead of liberal Democrats and leaners (73%) and more than the general public as a whole (67%). Conservative Republicans and leaners also were far more likely to say they had given “some” or “quite a lot” of thought to the election – 81%, compared with 70% of liberal Democrats and leaners and 67% of the general public. Although the two most conservative types together account for less than a quarter (22%) of the general public, according to the typology report, they make up more than a third (36%) of all “politically engaged” Americans – those who are registered to vote, say they always or nearly always vote, and closely follow public affairs. Similarly, Solid Liberals are a greater share of the politically engaged (21%) than they are of the general public (15%). 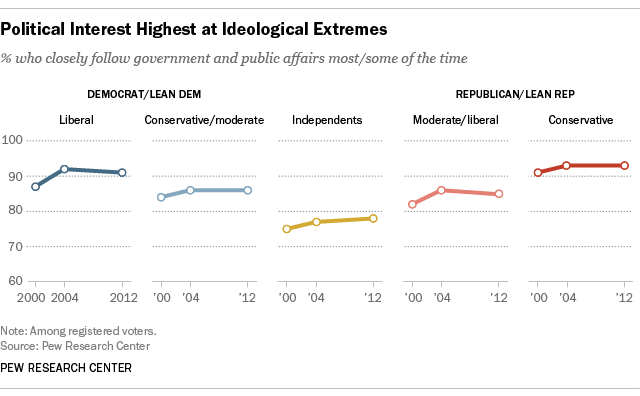 It’s the less ardently partisan groups that are less engaged in political life.